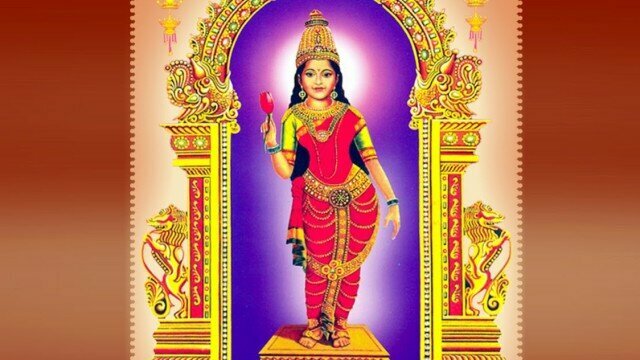 Sri.Vasavi Kanyakaparameshwari is the goddess or kula devatha of the Arya Vysya community as mentioned in the Vasavi Puranamulu written in Telugu during the 10th century AD.The most famous temple of this goddess is located at Penugonda,West Godavai District,Andhra Pradesh,India.Kusuma Sresti, the king of the Vysyas was ruling the kingdom making Penugonda (called the Kasi of Arya Vysyas)(Jestasailam) as capital city for all the 18 mahapattana’s during 10th–11th century AD. Kusumamba was his wife. They were ideal couple and led a peaceful domestic life. They were worshipping Lord Siva (Nagareswara swamy) and Lord Vishnu (Janardhana Swamy) as the part of their daily duties. His kingdom was part and parcel of Vengidesha, which was ruled by Vishnu Vardhana-7 or Vimaladitya Maharaj.